With Christmas fast approaching and with a trip up north for two weeks to visit family on the cards, I was keen to get out one more time before I traveled. In the end I decided on a location where I knew I had a better than average chance of getting a solid bass above the 40 mark to just feed the addiction. So with the only time available being a small window for a morning session I headed off early with the plan of being on the water during twilight. I arrived at the launch site to hear cicadas belting out their rhythmic chorus, which always gets the blood pumping, and distracted me from the considerable portage down to the river. 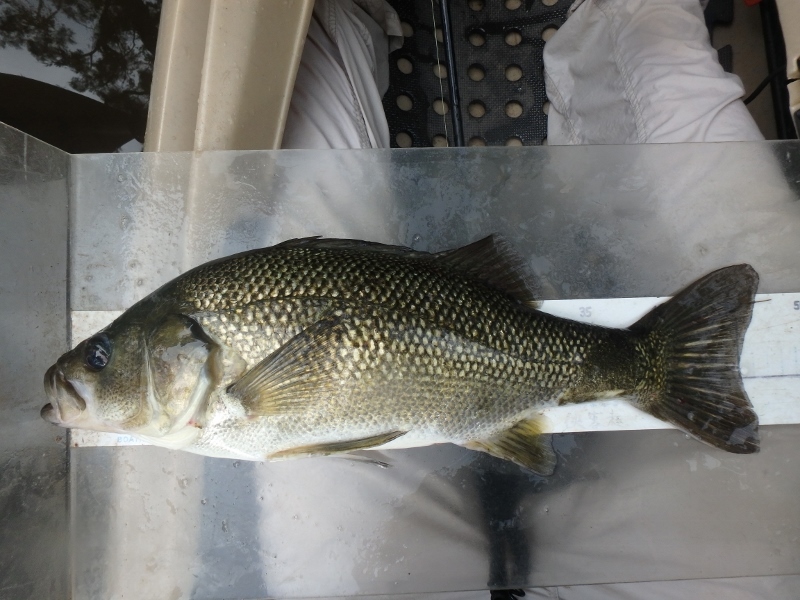 Upon arriving at the waters edge I was a little disheartened to see the water levels much lower than I anticipated and that many of the structures I typically fished were grown over with aquatic weed and grass. The pebbles on the river bed were also really slippery and covered in what I not so fondly refer to as “slime” which makes walking through shallow sections such a challenge. After slipping into the water I promptly headed upstream and spent the next hour or so casting fruitlessly without so much as a ripple. 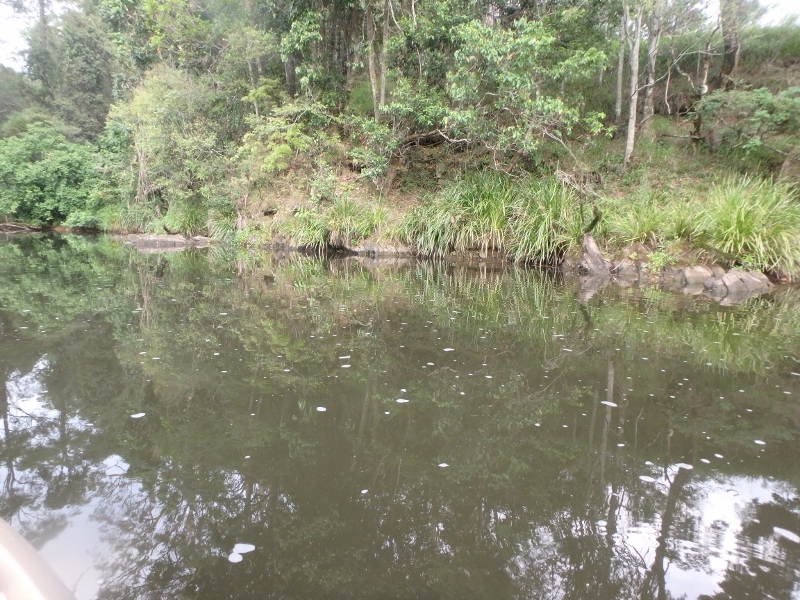 It wasn’t until I reached the head of the second pool that a cast into a rocky embankment fringed with Lomandra was”boofed” off the surface by a solid fish that must have been lingering there after its night spent hunting. At 36cmFL (photo too blurry) it was a great way to kick the day off and make the travel worth the effort. 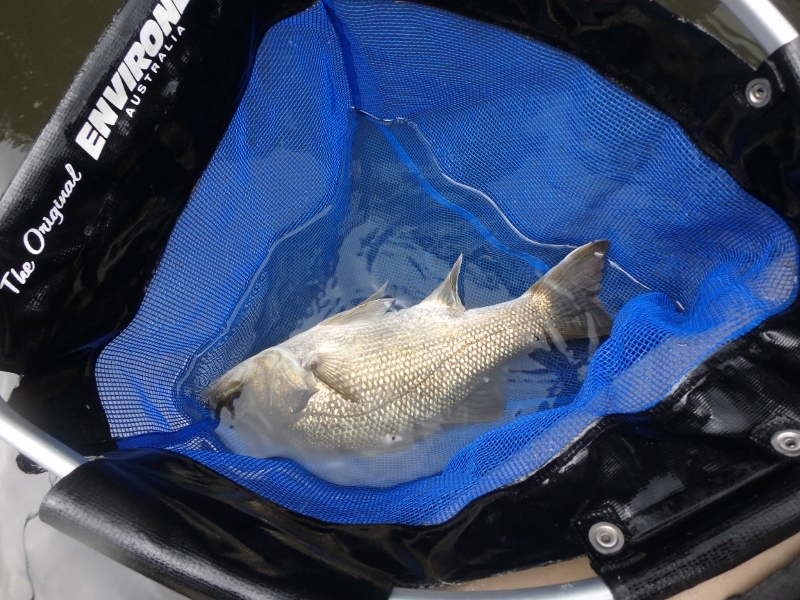 The next 20 minutes at the head of the pool saw me net another 3 small bass ranging from 23 – 33cmFL and erase the pessimistic hour of nothing. 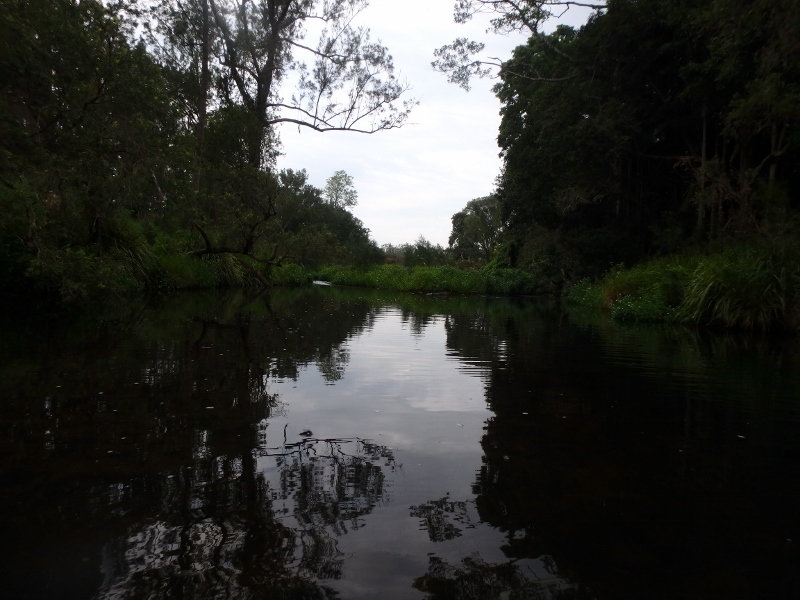 I continued upstream and was astounded at the height of the grass and riparian weeds that had sprung up between pools. In parts they were at eye level and made dragging the kayak quite difficult but also gave me encouragement that many would not take the effort to traverse between sections of the river. Reaching the next pool I sent out a long cast to the head of the pool where the water created a series of back eddies between two sources of flow. 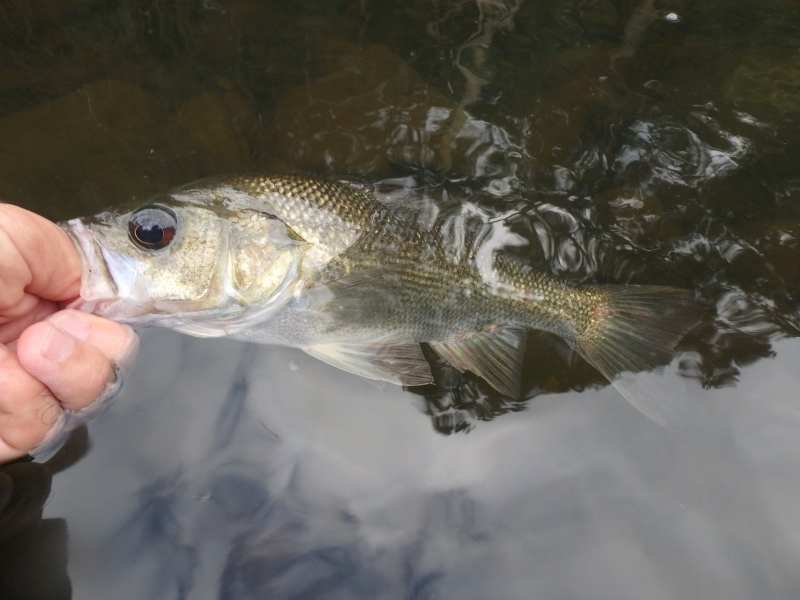 Even though the water was shallow I knew their were a couple of deep pockets on the left bank and I hoped that a bass might be residing there waiting for food to float downstream. This strategy paid off when a 34cmFL bass charged across the shallows 3m to smash the Sammy 65 which was a great visual display. Pushing further upstream through the thick riparian foliage I eventually reached my favourite pool in this section of the river. 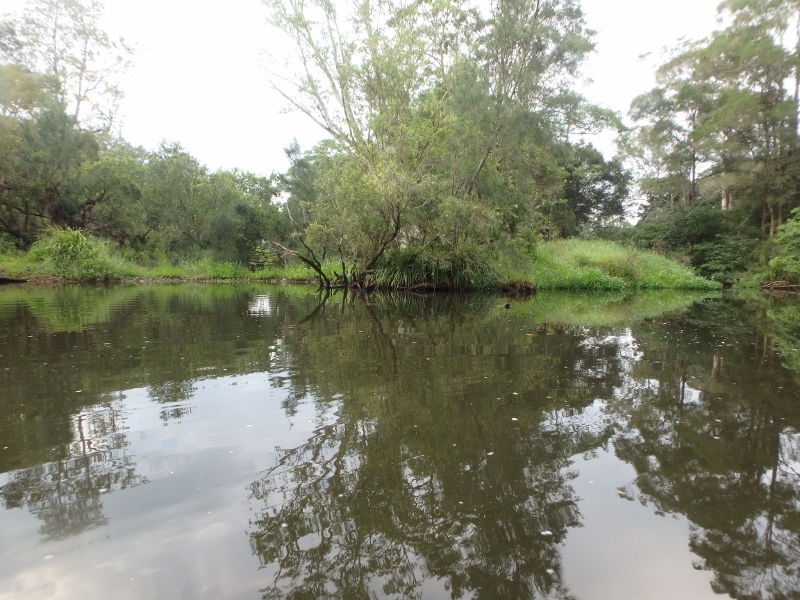 It has everything from permanent deep shade, to Lomandra fringes, deep water, large timber structures, flowing water and undercut banks. It almost always holds a fish and has been the location of some cracking bass that have blown me away at times. I cast away at all the secondary structures before eventually focussing my attention at the prime bass real estate. 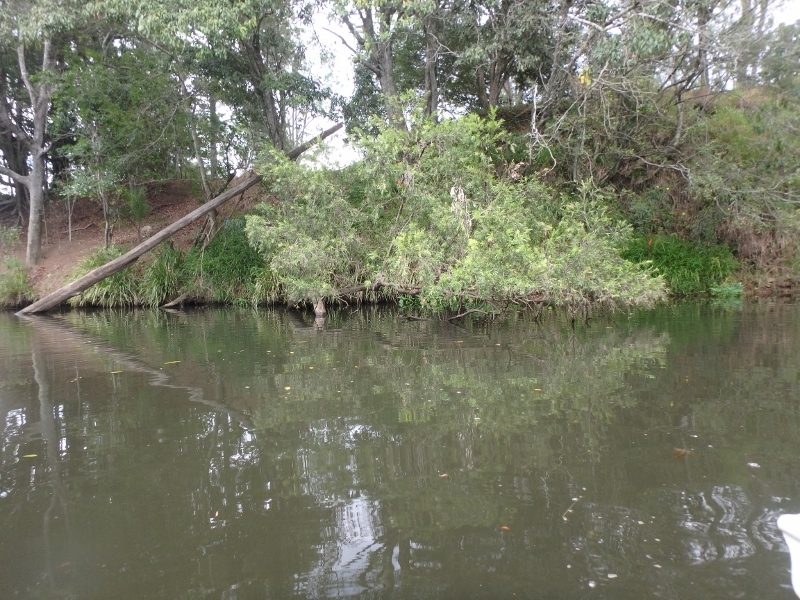 It was a solid tree trunk lying parallel to the bank in the darkest section of the pool. Sitting a metre or so from the river bank it’s back drop was an undercut bank of sedge that cascaded from the bank to form a curtain. 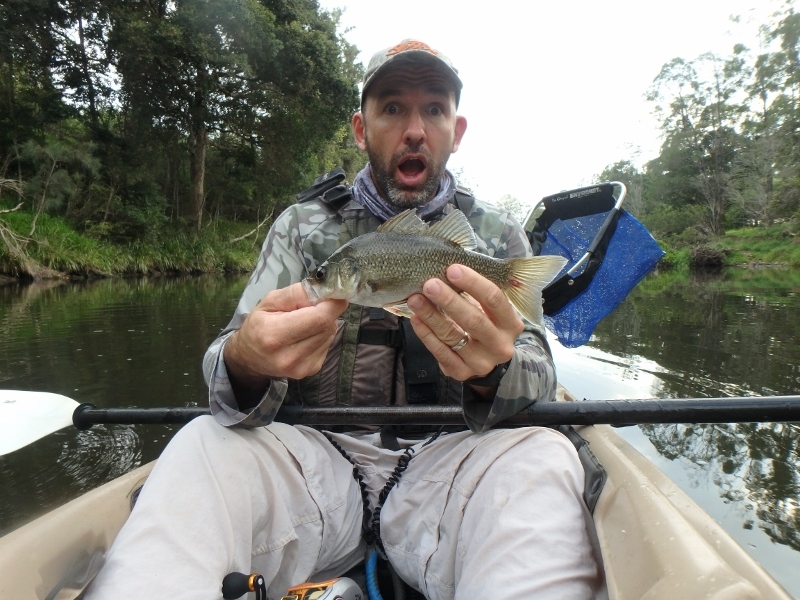 Initially my first couple of casts around the structure were ignored and it wasn’t until the third cast that a big bass cannoned up from the timber to annihilate my Sammy. Thankfully she chose to hit the lure between my kayak and the timber because if she had hit it behind the snag I would have been in serious trouble. 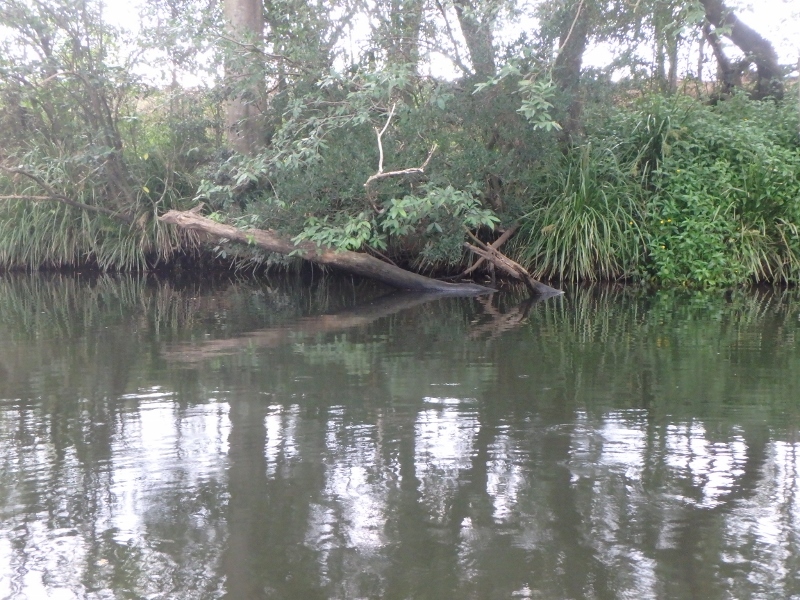 As it was she turned and powered back to the timber but through a bit of luck, thumb control and guidance I was able to extract her with a lowered rod tip out from beneath her woody lair and into open water. 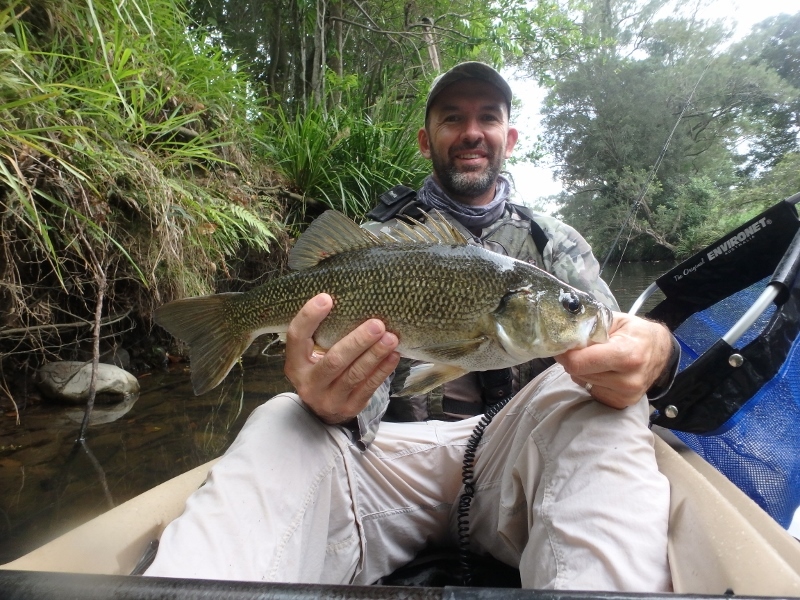 Once netted and measured this well conditioned bass in her prime was 45cmFL and a perfect way to celebrate my last session for 2016. I continued upstream cursing at the slippery rocks that were making portage a pain in the shallow water. I then managed to miss the next two fish in the next pool before reaching my final destination before I would be forced to turn around. I haven’t pulled any big fish from this pool but I have missed a few monster hits in uncompromising country of which I do not know whether I should be thankful or not. 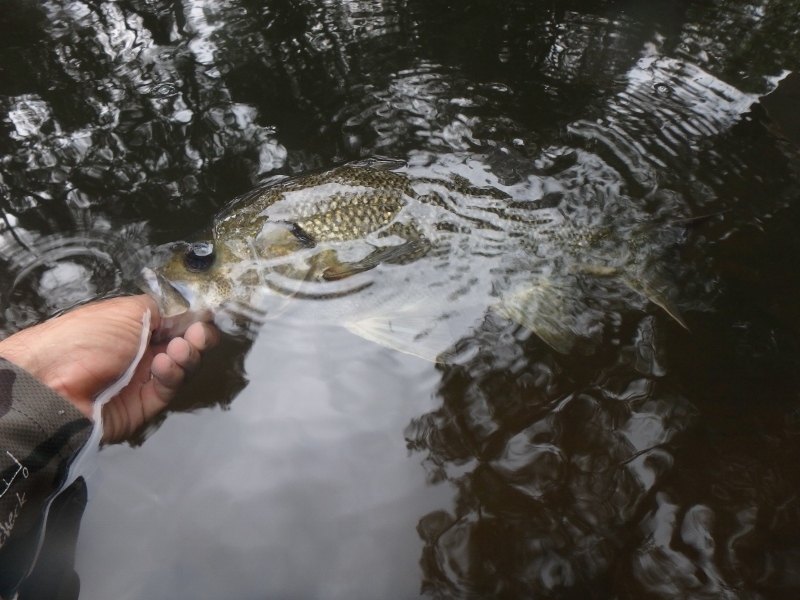 The pool itself is a mass of timber throughout its length and there is no clear water to extract a bass and fight on your terms. 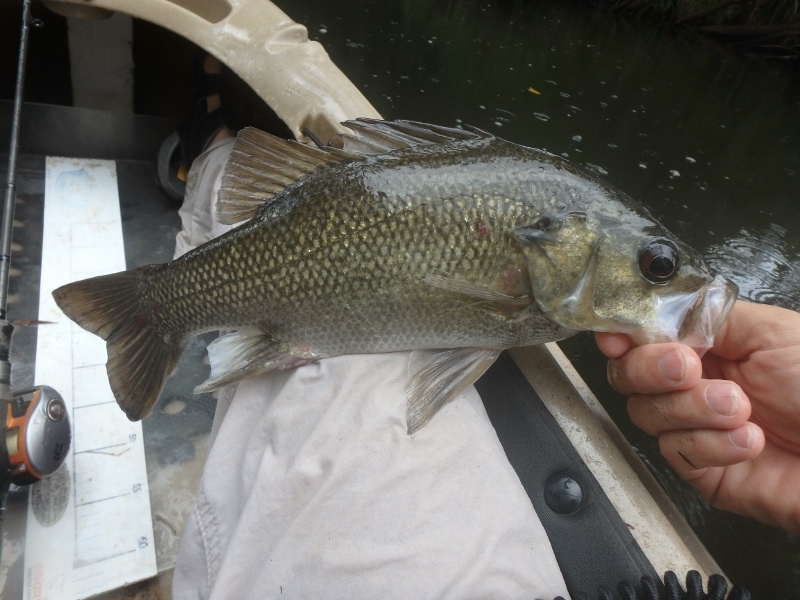 It didn’t take long before a cast beneath an overhanging Callistemon bush was smashed by a resident bass and another mid-thirties fish was added to the day’s tally. At this point I had one of those surreal naturalist moments that you just don’t get without the stealth element of kayak fishing. 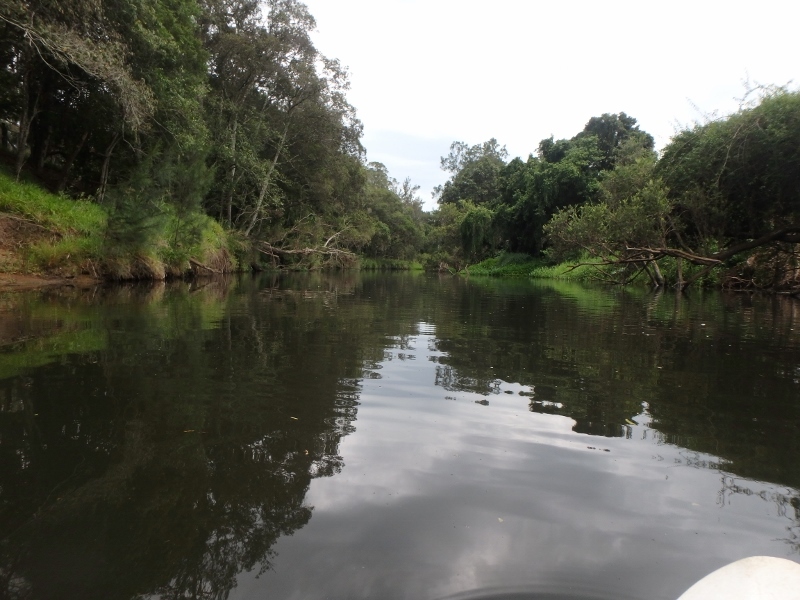 As I paddled a little upstream there was the sound of multiple splashes along the riverbanks as almost every water dragon inhabiting the area launched into the water. Seconds later a massive shadow made its way over my kayak and I looked up to see the ridiculously huge wingspan of a wedge tailed eagle sail overhead. To be honest I always imagined these behemoths to reside further inland where there are lots of sick/dying/dead lambs and roos, so I was very surprised to see one in a coastal freshwater stream. 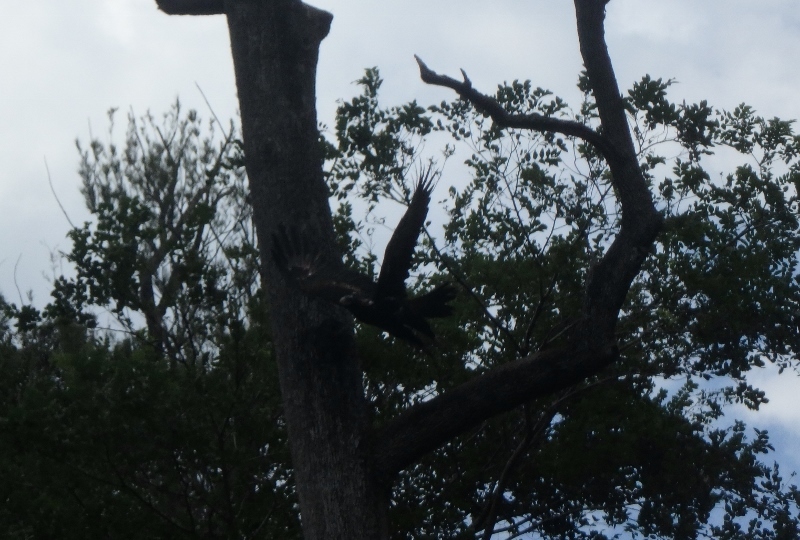 It glided to the top of a tree and watched as what I can only assume was a very mature youngster winged in and landed on the riverbank and presided to chase water dragons too slow to have made it to the river. Not only were this pair miles from where I though they should be they were also chasing water dragons on foot in the riparian undergrowth, bizarre! Moving towards the top of the pool I missed a corker that was hiding amongst some weed and charged out to smash my lure and then retreat. 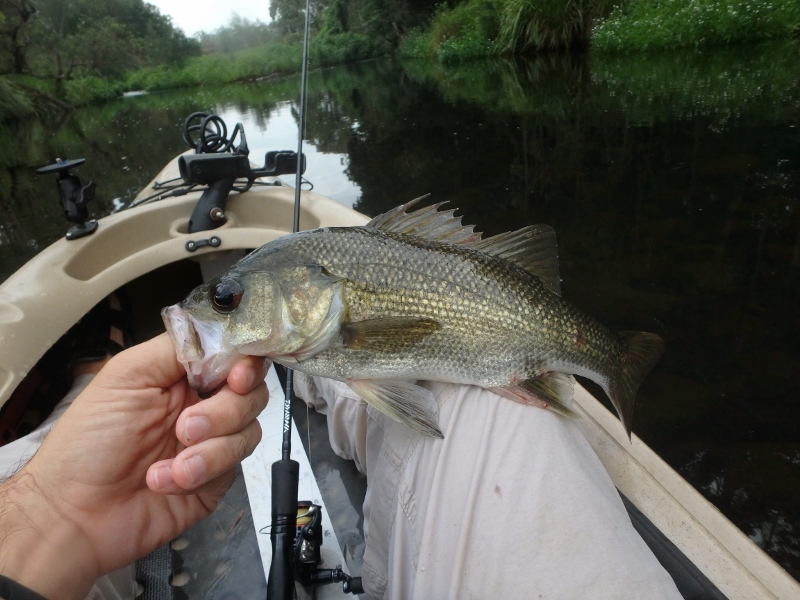 I then managed another two mid-thirties bass amongst the overhanging bottlebrushes before it was finally time to head back. 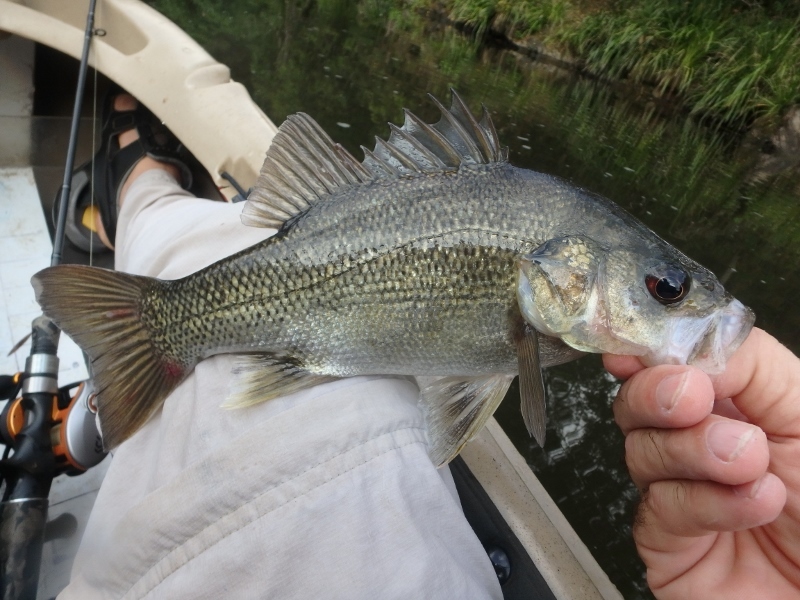 I continued to throw a few more casts on the return journey but got no interest at all from the local bass population. It wasn’t until the last pool that I had another of those rare moments in nature. 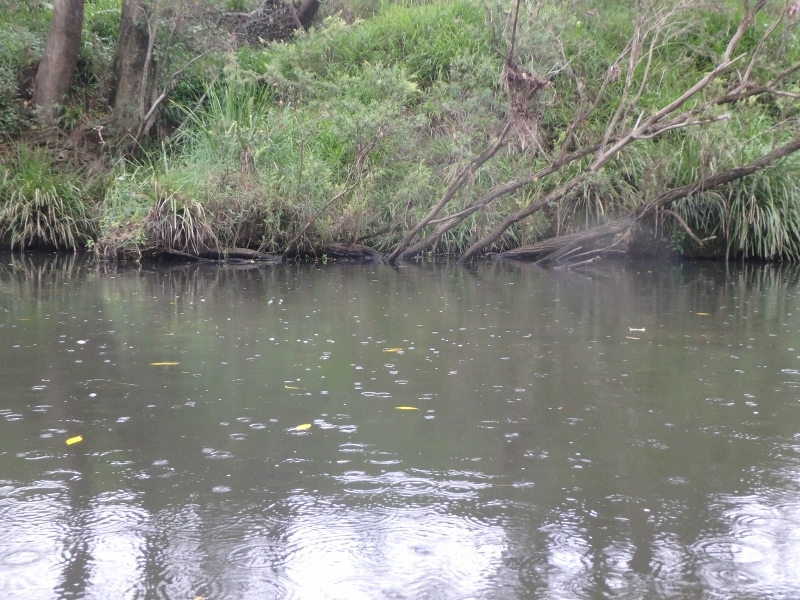 As I paddled down my launch pool I noticed a mass of Tandanus catfish in some form of breeding swarm. There must have been twenty odd fish in the shallows with plenty more lurking in the deeper water attracted to the commotion. It wasn’t until I chatted to a friend of mine who is doing his phD on these amazing fish that we came up with a theory for the behaviour. Most likely it was a single female that had retained her eggs late and was dumping them due to missing the opportunity to breed. The rest were males trying to fertilise the eggs and attracted by the pheromones released into the water as a result. I decided to capture a video of the action and as I got closer I noticed one of the participants was not a catfish. A mid-thirties bass was circling the riving mass in what could only be described as a very excited and little voyeuristic state. As you can imagine I quickly dropped the camera and sent in a cast which was promptly belted in full sun and at best 20cm of water. The bass missed and Di not return but it did add to my every growing list of tall and short fishing stories. 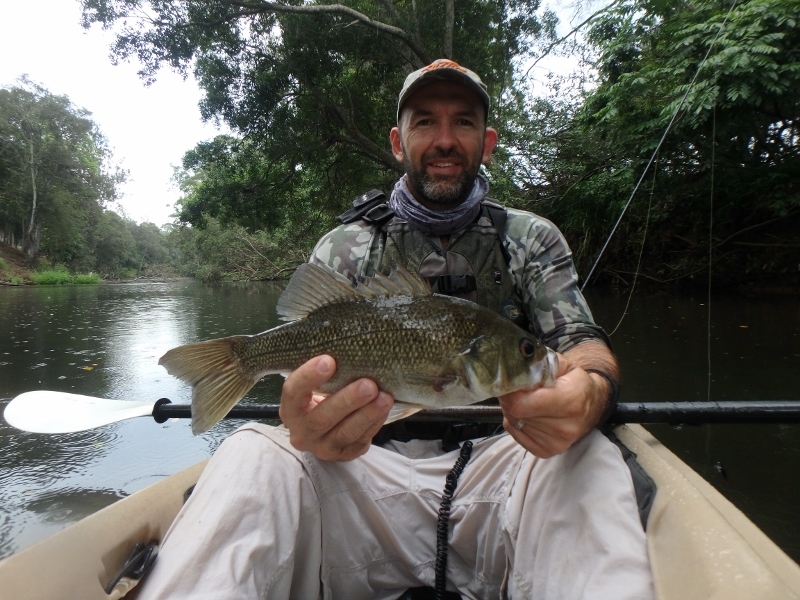 So at the conclusion of my last trip for 2016 I had managed 10 bass over the morning, all off the surface and topped off with a 45cmFL beast. Thanks 2016 it has been a hoot!